This cake was awesome! We stored it in the fridge due to the cream cheese filling and it was still delicious 3 days later. Even if you don’t want to make the entire thing, the frosting is exceptional. I’m trying to think up other applications for it – maybe cupcakes or muffins. Very simple and delicious – my two favorite combinations! 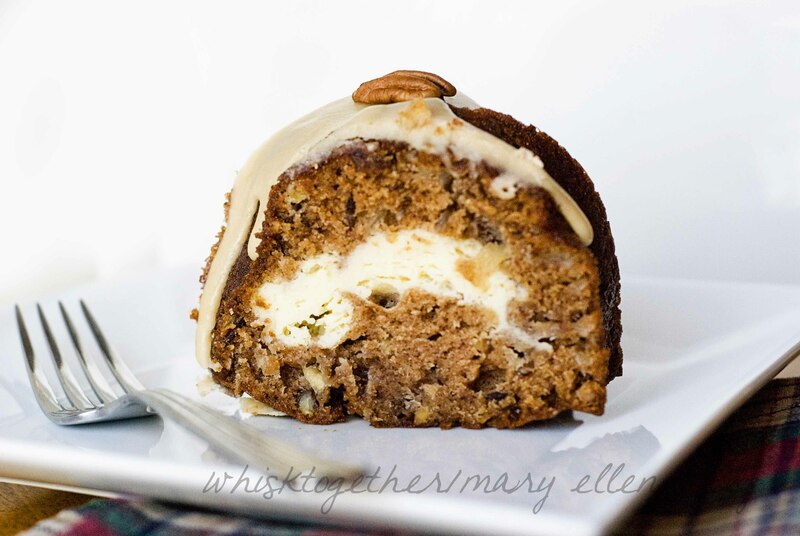 The cake is moist and flavorful with bits of apple and pecans throughout. The spices really shine through and the crumb is tender and medium sized. It was easy to slice and serve. Decorating was simple and pretty and a breeze. 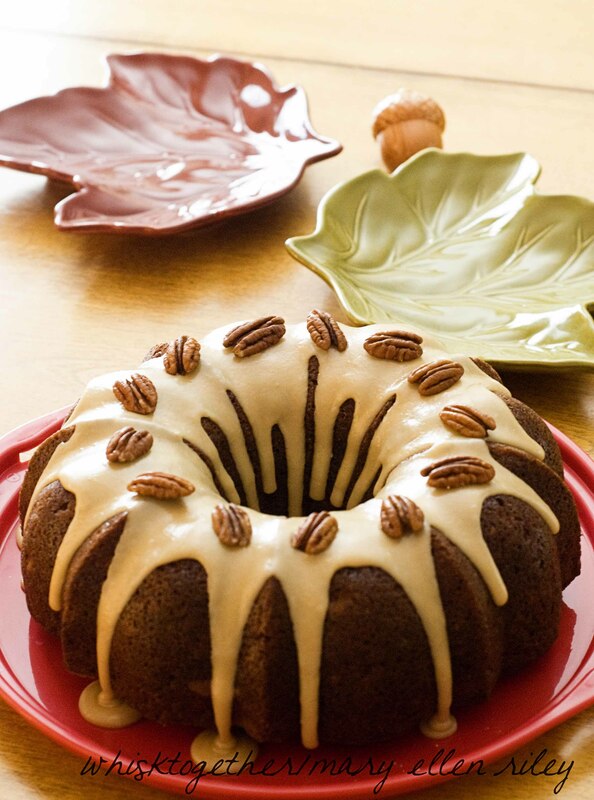 I may be a new fan of bundt cakes – I really don’t care for decorating a whole lot. The cake does take a little time especially since I had to finely chop 4 Gala apples. I saved some time using my apple/corer/slicer and this cake didn’t seem to take as much time as a lot of my cupcakes other layer cakes do. The reviewers on the original Southern Living website all gave this 5 stars as well! I couldn’t wait to bake it – even the batter was good! **Update 11/10** The cream cheese filling is difficult to keep inside. I did it the first time. The second time I made this I am having a little trouble and here is what you can do: make the cream cheese filling and then put it in the fridge. This will firm it up and then it won’t spread in the middle getting all over the layer. 1. Filling: Preheat oven to 350 degrees. With an electric mixer in a big bowl, beat the cream cheese, butter and sugar on medium speed. The mixture should be smooth. Add your egg, flour and vanilla. Beat on LOW speed – cream cheese mixtures usually need to take it slow. Mix until blended and set aside. 2. Cake: Make sure your pecans are toasted: you can toast them in the oven at 350 for 8-10 minutes, or in a skillet over medium heat for 10 minutes – making sure they don’t burn! Stir once in a while. 3. Mix your dry ingredients together in your mixer. I used the whisk attachment: flour, sugar, brown sugar, cinnamon, salt, baking soda, nutmeg, and allspice. Then using the paddle attachment, add the eggs, oil, applesauce and vanilla. Remove from the mixer and stir in the apples and pecans by hand. 4. 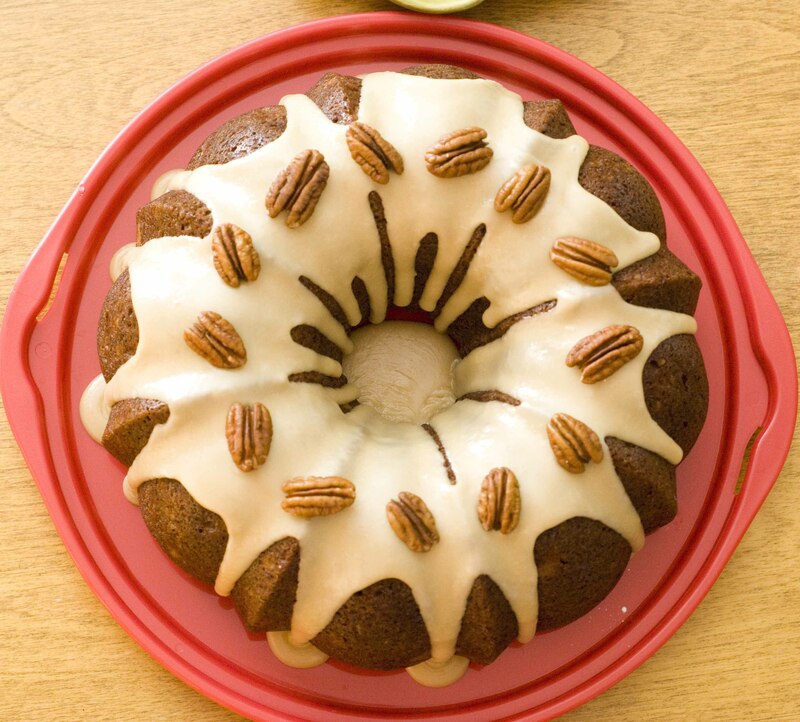 Grease and flour your bundt pan (12-14 cup size) or use Baker’s Joy. Baker’s Joy is a ton easier. 5. Add about 1/2 of the cake mixture to the pan. Drop spoonfuls of cream cheese mixture. Try to avoid the edges. It is difficult… but try. I used a cookie scoop to help. Use up most to all of the cream cheese mixture. Now, spread and add the rest of the cake batter on top. 6. Bake for 60-70 minutes. Cool cake for 15 minutes. Then, invert onto a wire rack and cool another 2 hours. 7. Frosting: In a saucepan, heat the brown sugar, butter and milk. Boil over medium heat. 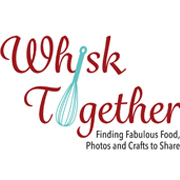 Whisk and whisk. Continue to boil 1 minute and whisk some more. Take it off the heat and add in the vanilla. Whisk in the powdered sugar and allow the mixture to cool to thicken a little bit before pouring over the cooled cake. I tried using regular powdered sugar and it seemed clumpy, so I started to sift it and it stopped being clumpy. This is a beautiful and delicious looking cake! Would love to try this one!